BISS Ch Kings Valley Demuir Here I Am, R.O.M. (Cameron), whose mother Ch. 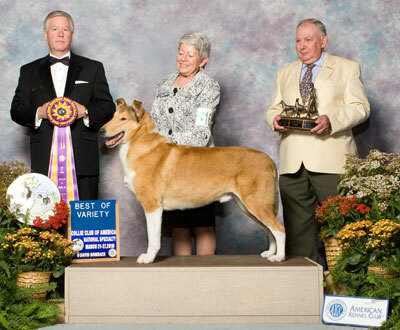 Kings Valley Just My Style, HC, TC (Tawny) is one of our most beloved dams, has been named Collie Club of America’s Best of Variety Smooth in 2010. Cameron was also named the CC of A 2010 Best Stud Dog (Smooth). Download Cameron’s pedigree (PDF from Collies Online). Cameron has been happily retired since 2014. Find out more about our Current Winners! CH Kings Valley Just My Style HC TC (Tawny) and I congratulate her top winning son, Cameron, on his Prestigious 2010 CC of A wins. To esteemed Judge Carl Williford for the experience of a lifetime – and a moment I’ll never forget – watching him award Cameron CC of A BOV Smooth! To Judge Bill Holbrook for acknowledging Cameron as a sire of note and declaring him best Smooth Stud Dog. To Judges Anne Cross and Tom Coen for Cameron’s Award of Merits, 2006 and 2008. TO his supportive friends and handlers, Nancy McDonald for handling him to 2010 Best Smooth Stud Dog and the 2006 AOM and to Nancy Anstruther for the 2008 AOM. To Cameron’s loving owner Lana Group who has piloted him through his magnificent career. To his skilled and poised handler at the 2010 CC of A, Diane Steele, in whose hands Cameron was happy and at his best. and to the many talented and dedicated breeders whose hard work laid the beautiful foundation we built on … and without whose efforts and combined talents this dog and this day would not have been possible!